Wrinkles are a natural part of aging, especially for the face, neck, hands and forearms. But some people are more prone to wrinkles based on sun-exposure and other factors. Although genetics mainly determine skin structure and texture, sun exposure is a major cause of wrinkles, especially for fair-skinned people. Pollutants and smoking, also contribute to wrinkling. While some people welcome their wrinkles, as a sign of character, if your wrinkles bother you there are things you can do to minimize developing wrinkles. Protect your skin — and prevent future wrinkles — by limiting the time you spend in the sun and always wearing protective clothing, such as wide-brimmed hats, long-sleeved shirts and sunglasses. Also, use sunscreen when outdoors, even during winter.The American Academy of Dermatology recommends using a broad-spectrum sunscreen with an SPF of 30 or more. Apply sunscreen generously, and reapply every two hours — or more often if you're swimming or perspiring. Use products with built-in sunscreen. When selecting skin care products, choose those with a built-in broad-spectrum sunscreen — meaning it blocks both UVA and UVB rays. Dry skin shrivels plump skin cells, which can lead to premature fine lines and wrinkles. Though moisturizers can't prevent wrinkles, they may temporarily mask tiny lines and creases. Even if you've smoked for years or smoked heavily, you can still improve your skin tone and texture and prevent future wrinkles by quitting smoking. There is some evidence that certain vitamins in your diet help protect your skin. More study is needed on the role of nutrition, but it's good to eat plenty of fruits and vegetables. The Food and Drug Administration (FDA) classifies these creams and lotions as cosmetics, which are defined as having no medical value. So the FDA regulates them less strictly than it does drugs. This means that products don't need to undergo rigorous testing for safety and effectiveness before approval to go on the market. Because the FDA doesn't evaluate cosmetic products for effectiveness, there's no guarantee that any over-the-counter product will reduce your wrinkles. If you're looking for a face-lift in a bottle, you probably won't find it in over-the-counter wrinkle creams. The benefits of these products are usually only modest at best. 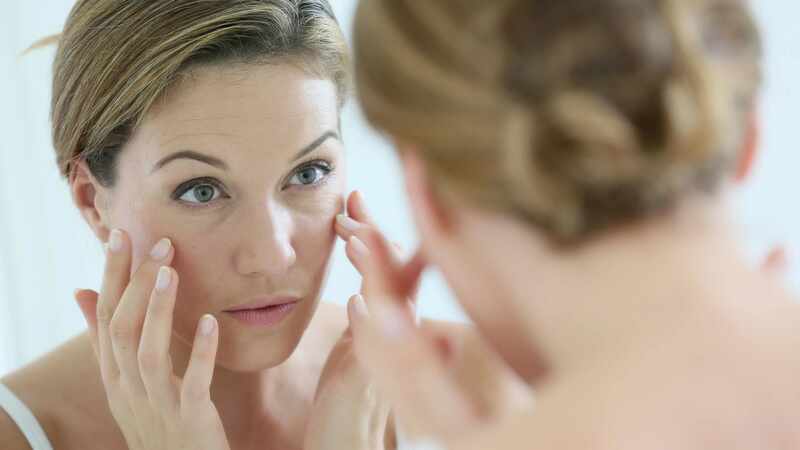 Retinol is a vitamin A compound, the first antioxidant to be widely used in nonprescription wrinkle creams. Antioxidants are substances that neutralize free radicals — unstable oxygen molecules that break down skin cells and cause wrinkles. Another potent antioxidant, vitamin C may help protect skin from sun damage. Before and between uses, wrinkle creams containing vitamin C must be stored in a way that protects them from air and sunlight. Alpha hydroxy acids, beta hydroxy acids (salicylic acid) and poly hydroxy acids are exfoliants — substances that remove the upper layer of old, dead skin and stimulate the growth of smooth, evenly pigmented new skin. This ingredient may help reduce fine wrinkles around the eyes and protect the skin from sun damage. This ingredient has been used in products for wound healing, stretch marks and now wrinkles. Green, black and oolong tea contain compounds with antioxidant and anti-inflammatory properties. Green tea extracts are the ones most commonly found in wrinkle creams. In addition to its antioxidant and anti-inflammatory properties, grape seed extract promotes wound healing. A potent antioxidant, this substance is related to vitamin B-3 (niacin). It helps reduce water loss in the skin and may improve skin elasticity.